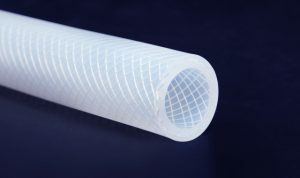 Platinum cured Silicone Hose Reinforced with Polyester Braiding has excellent flexibility for pressurized fluid transfer application in pharmaceutical and Biotech Industries. We are catering these products to all pharma and biotech companies in India and Overseas. It is platinum cured silicone hose reinforced with SS 316L helical wire. It has better transparency to visualize flow and kink resistance.Imavac is designed for material transfer application under high vacuum in pharmaceutical industries. The product is more superior compare to polyester braided hose in high pressure & high vacuum rating applications. It is also used for antistatic application. It is platinum cured silicone hose reinforced with SS 316L helical wire and polyester braiding having better flexibility with high pressure resistance. It is having high burst pressure rating along with high vacuum resistance. The product is suitable in pressurized fluid transfer application.